Community health workers (CHWs) are the current development darlings. They are the topic of panels and publications from one continent to the next. Not only are they an off-the-books cadre of health worker available to do the least desirable work in the most remote areas, many do it for free or for simple incentives. They are reaching that last mile, where need is so great. The real life of a CHW is challenging. For example, Betty walks many miles a day from one village to the next carrying a backpack heavy with simple supplies like iron tablets, water sterilizing pills, vitamins, a thermometer, a first-aid kit, a scale, and educational materials. She also has to carry thick registries to record information. Sometimes she arrives to a snake bite or a premature labor, and she just doesn’t have the training or the materials to provide the care that is needed. She needs support. She needs a nurse. Nurses are the lynchpins of the health system, especially at the community level where resources are scarce and needs are endless. Some CHWs can call the nurse at a nearby health post. But phone connections are unpredictable. Even when she can connect, her nurse supervisor has a line of waiting patients, so she may not be able to answer. Betty has an app on her mobile phone and some job aids to guide her work. But apps cannot replace a mentor or supervisor, and they do not assist her with the challenges that are beyond her skills and training. Betty needs a nurse.Nurses are the lynchpins of the health system, especially at the community level where resources are scarce and needs are endless. At that level, the nurse is not only a clinical provider but a multitasker. It may not be in her job description, but she is also a manager, supervisor, IT specialist, counselor, trainer, and hand holder. For most of these roles, she has no training, and for most, her valiant efforts go unrecognized. Nurses and midwives working in remote areas don’t have a staff or department like their colleagues in the district hospitals. At rural health centers, a single nurse is often the lone clinical professional working with power outages and supply shortages to serve multiple villages. When she’s lucky, she transforms a ragtag combination of new graduates and volunteers into a health team. Recently, a group of nurses—some retired, some willing to give their extra time—connected with lesser trained health workers, volunteers, and community members in Tanzania to do something to improve community health services. They independently organized themselves into small private entities and now offer services to whomever needs them. Sometimes the call comes from a CHW (or health outreach volunteer), sometimes it’s from another nurse who needs moral support or clinical backup, and sometimes a family will call directly. These responders may charge a small fee to those who can pay to cover their own expenses, but they often give free services when there is no ability to pay. It is common knowledge if you want something done, you can count on a nurse. This innovative solution has caught on. It has even captured media attention. Tanzania’s acting Chief Nursing Officer (CNO) decided she better see what these nurses were up to. You see, the CNO along with the regulatory councils are both part of the health ministry and are responsible for protecting the population and ensuring quality health services. A more risk-averse CNO may have tried to shut them down. But this CNO connected with faculty from the Muhimbili University of Health and Allied Sciences, and they put their heads together with members of the Tanzanian National Nursing Association to figure out how to handle this unusual situation. They have proposed that these cross-cadre private entities come together and form a kind of hybrid association. As an association, and with some added roles in guiding training and regulations, this partnership of private entities will have more credibility, accountability, and access to resources. As a global health advisor, I understand health workers and the systems that enable them. It is a complicated field. Governments can’t take action before they’ve achieved consensus and obtain approvals. Moreover, they may be reluctant to invest in health workers or systems because the time it takes to show results goes beyond the election cycle. So I was struck when I learned that the CNO with colleagues from the academic sector, had taken such initiative. I should not have been surprised. It is common knowledge if you want something done, you can count on a nurse. Nurses will work after hours, across sectors, and with other cadres to make a difference. Today, during the ICN conference in Seoul, South Korea, where the theme is "Global Citizen, Global Nursing," I celebrate the Tanzanian nurses—and all nurses—who go beyond their job descriptions to create solutions to real challenges. Three cheers for nurses! They truly are both global citizens and community heroes.I’d like to acknowledge Dr. Amalberga Alex Kasangala, Acting Chief Nursing Officer, Tanzania, Dr. Thecla Kohi, Senior Lecturer of Nursing, Muhimbili University of Health and Allied Sciences (MUHAS), and Dr. Lilian Mselle, Lecturer of Nursing, MUHAS, Tanzania. 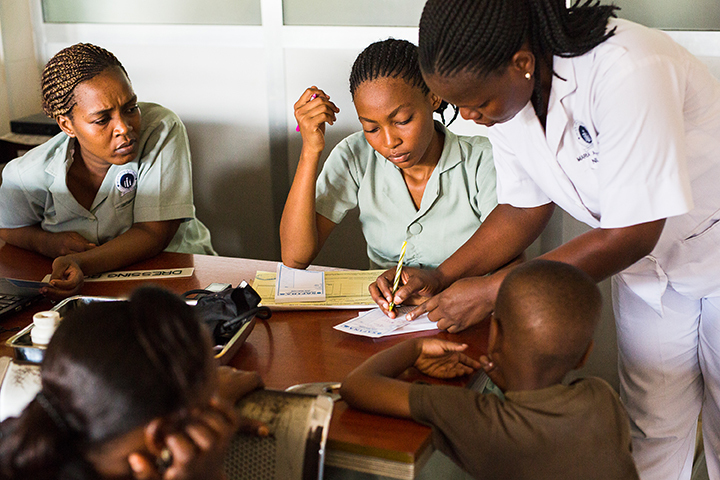 Photo of health workers in Tanzania by Trevor Snapp.